I finally started my Christmas baking last night after work. I have been sidetracked this year by some big and little distractions alike. Thank you all for praying for my dad. While his diagnosis is not what we hoped for...he is doing much better now thanks to some new medications. I had a three year old "helper" last night so I thought we had better start out slow. 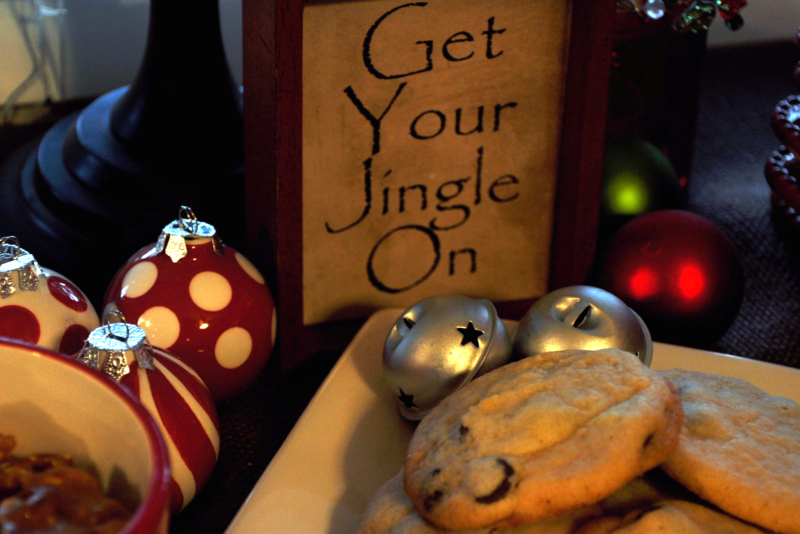 We tackled a few decorated sugar cookies and some classic chocolate chips. These will head out the door to work with me this morning. I probably won't get started on my family baking until Saturday when I have a few less fingers in the mixing bowl! Just curious, how soon do you start your holiday baking and how do you keep it fresh until Christmas time? Your cookies look yummy. :-) We started our holiday baking today. We just eat it as I bake it. I imagine the fudge I make has a long shelf life and does last longer than the cookies. You could freeze some if you want to save them for Christmas day. Good luck. Your pictures are always so inviting. Oh started today..with five year old hands. Some of it will freeze...pound cakes. The rest is going in gift baskets to friends and neighbors. Hi, Patty. I've made the shortbread, but nothing else just yet. I won't do a lot of baking, but will make some mince tarts; I made and froze the pastry, so it will be a quick job to assemble and bake them. I'm not quite sure what else I'll try! Your cookies look yummy! I have that problem too. You don't want the cookies stale. I know a lot of people freeze them but for our frosted ones you would have to wait to frost until thawed I would think. Hope all is well with your dad and you are at peace with what is going on. So hard and to keep up with everything else is almost impossible. I will probably start my baking for Christmas Thursday. I just try to store everything as ithgtly as possible and usually put in the fridge until the day of. I'll for sure be making raspberry linzer cookies and more of the praline bark! Have fun in the kitchen! Hehe, I meant to say as "tightly as possible" and not that mumble jumble that came out! It is always so fun to have little hands to help decorate the cookies. Takes the pressure of perfection off the shoulders and allows fun to ensue! Patty, I am sorry to hear that your Dad's diagnosis was not the news you had hoped. I will continue to keep him in my prayers. I don't bake until a day or two before handing it out. Some folks freeze. But my freezers have no room! made some banana bread Sunday but did not get my annual sugar cookies made, just ran out of time with working. I've been sewing instead of baking! You'll have sweeter things to eat though. I just started my baking today. I always just refrigerate until I need them and I never bake too far ahead. So glad things are better with your Dad. Your baking all looks very yummy! If I start mine too soon it will all be eaten, so I either make things at the last moment, or put things in the freezer! I don't do a lot of different things, mostly shortbread. It gets frozen but some manages to go missing . They all love it! Merry Christmas to you and yours. mmmmm....the cookies look very yummmy. Usually we bake cookies the week before Christmas and put them in airtight containers. Sometimes they aren't very fresh at Christmas, but we eat them up until Christmas : ) Merry Christmas Patty! !